This rather sweet letter was reproduced in the Richmond Times-Dispatch on Sunday, May 14 in 1916 on the front page. British Soldier, in letter to his little niece, describes how they do it. says writer in concluding epistle from battlefield. Special Cable to The Richmond Times-Dispatch. “You know ‘or’nery’ people who don’t know nuffin’, and who think reason explains everything. would just tell you the reason why most bullets don’t hit anybody is just that they miss ’em. “But people who really understand – I mean people who have enough imagination to get up in their dreams and go out and see the fairies dancing on the dewy sward when the sunbeams twinkle on the crystal globules – these people know better. And I can tell you just how it is. “You see. the fairies have eyes like marigolds and as keen as eagles. They see 10,000 times as quick as mortals do, and they move just as speedily as thoughts do. “They see the bullets coming out of the rifles, and as it comes each bullet is bestridden by a fairy, who tweaks its nose and guides it harmless along, and the fairy sings sweetly all the time. “That is why when a bullet whizzes past your head you hear it humming like a bee, or droning like a bumble bee, or maybe whistling or whining or singing. “But sometimes yon don’t even hear that, and yet the bullet doesn’t hit you. You just hear it pass with a breathing whisper or a gusty noise. That is when no fairy has seen it in time to get astride and guide it, but all the fairies near a soldier just gather round and blow it past. 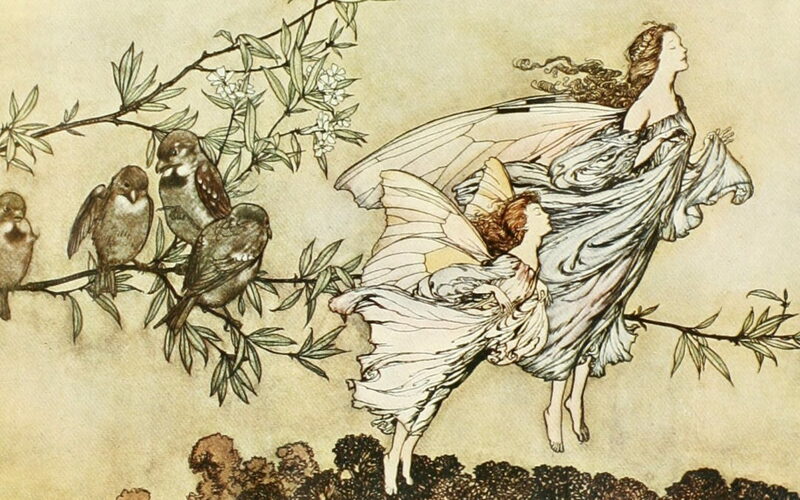 Top illustration by Arthur Rackham.